The year was 1925, the financial health of the nation was sound. Economists talked about "an era of prosperity" and the future seemed nothing but bright. However, the outlook for 27 year-old Howard Deering Johnson was not so bright. Johnson owed $40,000. He had voluntarily assumed business obligations left by his deceased father and had gone deeper into debt by borrowing $500 and taking over the operation of a small patent medicine store, soda fountain and newsstand, located in Wollaston, a section of Quincy, Massachusetts. The store was a money loser. Still, Johnson felt he could make it could work. The first thing he did was send out delivery boys to sell newspapers in nearby communities. Sales went up, then Johnson turned his attention to the soda fountain. The store sold just three flavors of ice cream-vanilla, chocolate and strawberry. Johnson believed the number of flavors should be expanded, but first, he was determined to improve the quality of the ice cream he was selling. Using an old-fashioned freezer in the basement, he began cranking away by hand and experimenting to develop the best product possible. By doubling the butterfat content and using only natural ingredients-Johnson came up with what he thought was a superior ice cream. His customers thought so, too, and soon they were standing in lines outside his establishment. The demand led to expansion and soon he was selling his ice cream at stands on nearby beaches and other locations. In three years, his debts were overcome and his business was a success. He added frankforts, hamburgers and other foods, carefully making sure of the best quality of content and preparation. His little store had become a restaurant and Johnson then decided that the food business was a way to greater success. In 1929, he opened another restaurant, in downtown Quincy, Massachusetts, and began planning further expansion. Later that year, the stock market crash threw the country into the Great Depression and Johnson's expansion plans became dim. Johnson had envisioned a chain of restaurants which would have the confidence of travelers. He believed the automobile would change the face of America and he foresaw better roads and more people on the move who would want good food at sensible prices. He owed so much money he couldn't borrow more, but he was eager to expand. Then, he conceived a new idea-franchising. Johnson talked another businessman into using the "Howard Johnson's" name on a Cape Cod restaurant, in return for a fee and an agreement to buy food and supplies from Johnson. The idea worked well for both men, and Johnson made similar agreements with others. That was the beginning of restaurant franchising, a system that has since been replicated by countless others. By 1935, there were 25 Howard Johnson's roadside ice cream and sandwich stands in Massachusetts. A year later , one of the first Howard Johnson's Restaurant in Connecticut was opened by Irving Carter, on Route 1 in Milford, CT. That restaurant remained open as a HoJo's until 1999. During the last years of the 1930's, the number of HoJo's Restaurants grew to more than 100 along the Atlantic coast all the way to Florida. The first turnpike restaurant in the U.S. was opened by Howard Johnson's on the Pennsylvania Turnpike. The company soon became the leading tollroad operator in the country. Business boomed and the Howard Johnson Company continued to grow. Then came World War II, and once again, Johnson faced financial disaster. Food rationing cut off the Company's supplies, and gasoline rationing and travel restrictions cut off his customers. Most of the restaurants closed and the Company faced bankruptcy. Johnson kept the Company alive by providing food for military installations, defense plants and schools. When the war ended, most of the restaurants reopened and new ones were built. The trend toward a scarcity of skilled chefs had already come into focus and steps to cope with this labor shortage had to be taken. Johnson pioneered the new convenience food concept of processing and pre-proporting food in Company-operated central plants and shipping to restaurants for final preparation and cooking to insure high quality standardized food service. 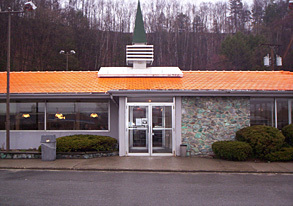 Each restaurant was topped with a bright orange roof so the traveler would immediately recognize the restaurant. This became a beacon to the travelers as Howard Johnson's became know for quality food at reasonable prices and with the added lure of ice cream available in 28 flavors. Howard Johnson's had 400 restaurants in 1954 when the Company entered the lodging industry with the opening of it's first franchised motor lodge in Savannah, Georgia. A pre-sold name in which the motorist placed confidence, soon became a combined dining and one-stop overnight convenience. In 1959, Howard D. Johnsons passed the reins to his son, Howard B. Johnson. Growth continued and the Company became publicly owned in 1961, with it's stock traded on the New York Stock Exchange. In the 1960's, HoJo still owned the road,expansion had stretched coast-to-coast. In 1965, sales exceeded those of McDonald's, Burger King and Kentucky Fried Chicken COMBINED! HoJo's was the second largest food feeder in the U.S., second only to the U.S. Army. In 1969, HoJo's developed the "Ground Round" restaurant concept, joining HoJo's previously established "Red Coach Grills" restaurants. By the late 1970's, HoJo's empire consisted of over 1,000 restaurants, more than 500 motor lodges, vending and turnpike operations and a manufacturing and distribution system. Despite this growth, competition from fast food chains and other, new emerging chains had cut into HoJo business. Howard Johnson's was sold by the founder's son to British conglomerate Imperial Group in 1980, for more than $630 million dollars. An effort with new management teams, new restaurant concepts and millions of dollars failed to rejuvenate the chain. Some of the new restaurant concepts started under Imperial's ownership include Bumbershoot's, Chatt's and Deli Baker Ice Cream Maker. Also, hotels called 3 Penny Inns failed to catch on. Nonetheless, in 1985, Imperial sold the company, except for "Ground Round," to Marriott Corporation. Marriott's interest was in the restaurant locations, which it planned to convert to its own concepts, so it quickly sold the motel/hotel/motor lodge system to Prime Motor Inns. The hotel system is owned today by Cendant Corporation, and has approximately 500 locations. Because the HJ Restaurant franchisees had worked for decades to develop their local business, there were obvious concerns about the long-term viability of the restaurant system. In 1986, a group of franchisees, led by former U.S. Attorny Griffin Bell, sued Marriott and Prime. 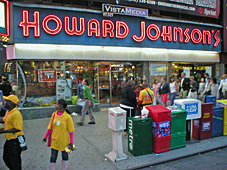 A settlement was reached that allowed the franchisees to form their own company, Franchise Associates, Inc. FAI then gained the rights to the name "Howard Johnson's," as well as the right to franchise restaurants and ice cream shops with the "Howard Johnson's" name. FAI also owned the original HJ recipes, and, to this day, sells items like Howard Johnson's Macaroni and Cheese, TenderSweet Fried Clams, Chicken Croquettes and Toastees in major grocery stores. In 1990, FAI opened a new prototype "Howard Johnson's Restaurant" in Canton, MA, in hopes of gaining new franchisees. In 2000, that prototype closed. There are currently 9 HJ Restaurants. The Springfield, Vermont HoJo closed on May 15, 2005, followed by the closing of the Bay City, Michigan and Millington, Maryland locations. The landmark Times Square's HoJo was shuttered at the close of businees on July 8, 2005, followed by the closing of the Asbury Park, New Jersey HoJo Restaurant in June of 2006, and the Waterbury, CT location in the spring of 2007. The Lake George Howard Johnson's Restaurant did not reopen in 2012. These closings leave only two (2) HJ Restaurants. FAI lost the rights to the Howard Johnson's name in terms of food and beverages in 2005, as Cendant (now Wyndham Worldwide) reclaimed those rights, and, in turn, sold the rights to the newly-formed La Mancha Group, LLC. LaMancha intended to relaunch the brand, starting with HoJo's Coffee in many of the existing HoJo lodging facilities in the near future, followed by expanded HoJo's frozen food products and HoJo's Ice Cream. Unfortunately, this never materialized, as La Mancha ceased to exist, and hope is dimming for any revival of the storied chain. All of the Howard Johnson's brands are owned by Wyndham Worldwide.